With restoration and painting work on the upper chassis coming along well, it was time to look at the metal box on which this upper chassis had been mounted. The original Pathé Marignon projector had a shallow steel base with folded edges, about 18mm high. This defined the overall footprint of the projector and acted as a base for the upper chassis. It also housed rubber feet to prevent the projector scratching any surface on which it was placed. above The original shallow base made of folded steel sheet. 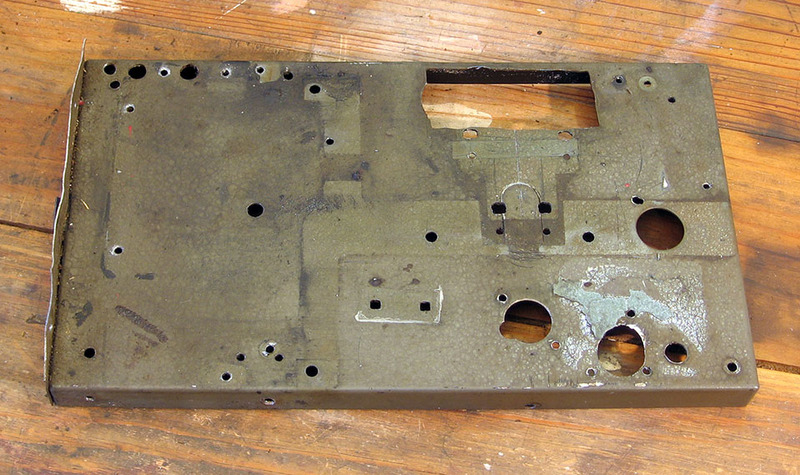 This had been drilled, cut and variously mangled over the years and the paintwork, like that on most of the machine, was badly stained with oil. My father had added another steel box underneath this original one. In fact it was an old radio or amplifier chassis, obvious from the valve (tube) socket holes which had been patched over with a sheet of aluminium. The entire box had been painted with grey crackle-finish paint, now well past its use-by date. 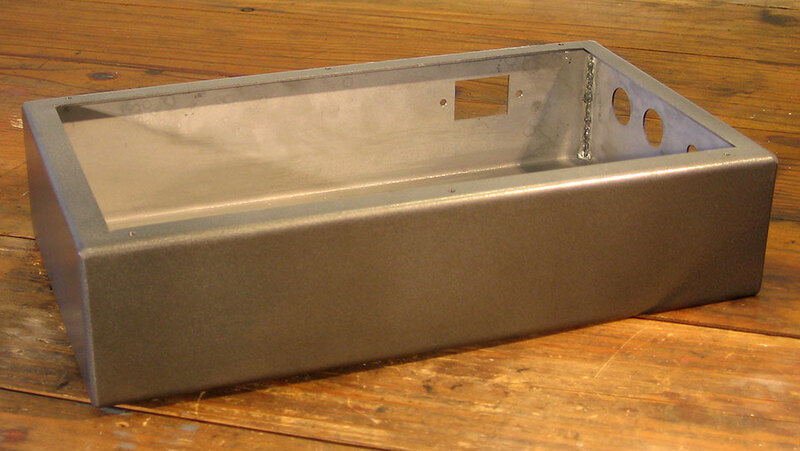 The purpose of this supplementary chassis base was to accommodate circuitry for optical sound. The 110volt AC input had been re-routed into this new base which sported a series of switches added by my father. above A view inside of the supplementary base showing the controls on the front-side of the box. My father had done considerable work on this machine over the years. 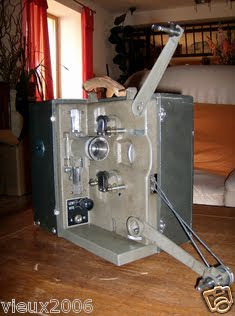 He had added optical sound to what was originally a silent projector. At one time he even added magnetic stripe playback (and perhaps even recording) facilities, which had subsequently been removed. All these changes had left a trail of holes drilled and then patched over. 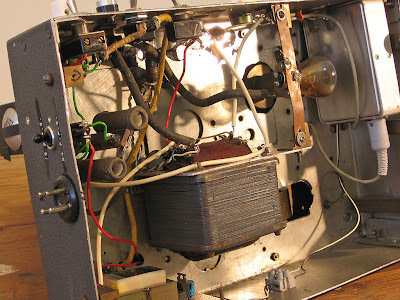 There were switches for motor, lamp, exciter lamp and audio pre-amplifier (which was built into the base). See the following photo. above A closeup of some of the controls on the supplementary chassis added by Denzil Howson. The motor, projection lamp, exciter lamp and audio amplifier each have their own toggle switches. The left hand knob controls motor speed via a wire-wound potentiometer. The right hand knob is output volume from the amplifier. 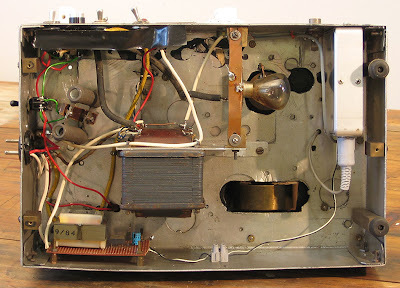 The supplementary chassis had originally been fitted with a valve pre-amplifier connected to a photo-electric cell. By the early 1980s, either the pre-amp or the photocell were malfunctioning. Having graduated from electrical engineering only a few years before, I designed and constructed for my father new electronics based around a phototransistor and an integrated op-amp for the pre-amplifier. 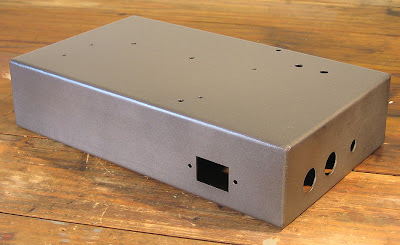 This new and more compact amplifer was built into a die-cast aluminium box mounted inside the projector base. Notable also on this modified Pathé Marignon was the motor speed control. This used a series-connected wire-wound potentiometer for speed adjustment together with a couple of fixed value wire-wound resistors to switch between nominal speeds of 16fps and 24fps (frames per second). Series resistance control of a universal (brushed) motor can be erratic and the motor speed was liable to wander around, requiring regular manual tweaking during projection to maintain close to a constant speed. Part of my plan in restoring this machine was to replace this series-potentiometer speed control with a solid-state electronic speed control. above This view underneath the supplementary chassis shows at top left the toggle switches seen on the previous photo. Below that are a couple of wire-wound resistors used in series with the brushed motor to switch motor speed between nominal 16fps and 24fps. At left bottom is a power supply for the amplifier. The large transformer at centre left provides 12VAC for the exciter lamp, above and to the right. The exciter lamp is simply a 12V car headlamp! Below the exciter lamp you can see a cutout through which the flywheel for the sound drum protrudes. Finally at top right is an aluminium box enclosing the “new” (1980s) solid state preamplifier for the optical sound photodetector. I decided early on that this supplementary chassis and its contents were not worth keeping. It was flimsy, full of holes and un-restorable. My initial plan was to simply replace this base with a new one of identical dimensions. However the question arose where to place the controls and the electronics for the new motor speed controller. One option would have been to fit the controls onto the upper cast aluminium chassis. This was where Pathé sited the original controls for the projector as can be seen in the photo below. above In this photo of a Pathé Marignon for sale on eBay you can see the original position of the controls in the upper chassis below the lens holder. 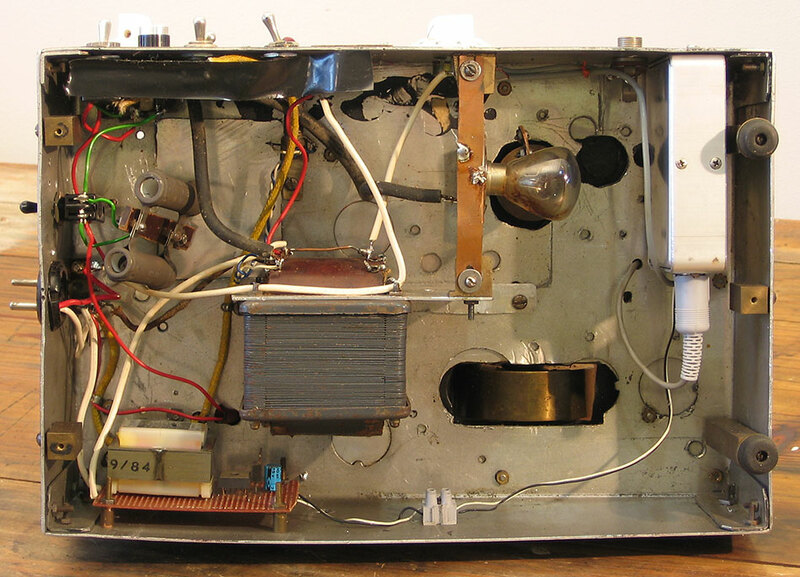 While the controls could have been mounted there at a pinch, there really wasn’t sufficient room to house the printed circuit board for the new motor speed controller inside the projector housing behind the motor and main drive mechanism. Hence I decided to replace the original folded steel base with one of identical horizontal dimensions but deep enough to accommodate switches, power inlet socket and speed control knob on the side panels. The interior of the box would be large enough to accommodate the new motor speed controller, itself constructed inside a die-cast project box. 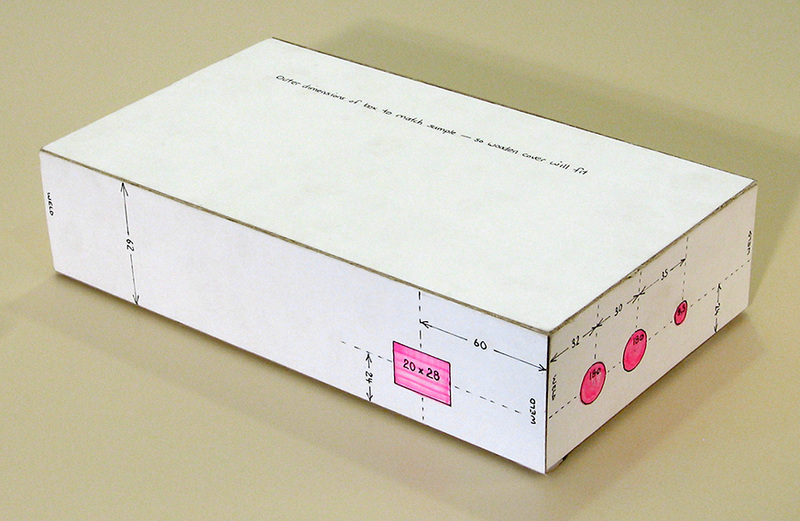 After careful experimentation and measurement, I constructed an accurate cardboard mockup of the new base. above The new projector base fabricated from cardboard with key dimensions marked. This was provided as a pattern to a local sheet metal fabrication shop who replicated it in sheet steel. Using a fancy water-cutter, they were able to make accurate holes for the power inlet socket and switches. above The new steel base after it had been drilled and painted with grey hammer-finish to match the upper cast aluminium chassis. I drilled the fixing holes in the top surface after very careful measurement against the tapped holes in the upper chassis. above The new steel base from below. As you can see, there is plenty of space inside to accommodate new electronics for the motor speed control. A separate steel panel screws onto the bottom to seal the unit. Having already ordered a kit for the new motor speed controller, it was now time to start putting that together. That’s the subject of the next post.